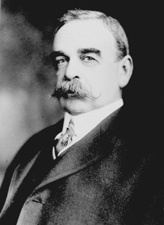 SAULSBURY, Willard, Jr., (son of Willard Saulsbury, Sr., nephew of Eli Saulsbury), a Senator from Delaware; born in Georgetown, Sussex County, Del., April 17, 1861; attended private schools and the University of Virginia at Charlottesville; studied law; admitted to the bar in 1882 and commenced practice in Wilmington, Del. ; president of the New Castle Bar Association and chairman of the board of censors; interested in banking and sundry business organizations; member of the Democratic National Committee 1908-1920; unsuccessful Democratic candidate for United States Senator in 1899, 1901, 1903, 1905, 1907, and 1911; elected as a Democrat to the United States Senate in 1913 and served from March 4, 1913, to March 3, 1919; unsuccessful candidate for reelection in 1918; served as President pro tempore of the Senate during the Sixty-fourth and Sixty-fifth Congresses; chairman, Committee on Coast and Insular Survey (Sixty-third through Sixty-fifth Congresses), Committee on Pacific Islands and Puerto Rico (Sixty-fifth Congress); member of the advisory committee of the Conference on Limitation of Armaments in Washington, D.C., 1921-1922; member of the Pan American Conference in Santiago, Chile, in 1923; engaged in the practice of law in Wilmington, Del., and Washington, D.C., until his death in Wilmington, Del., February 20, 1927; interment in Christ Episcopal Churchyard, Dover, Del. American National Biography; Dictionary of American Biography; Franseth, Gregory S., L. Rebecca Johnson Melvin, and Shiela Pardee, The End of an Era in Delaware: The Practical Politics of Willard Saulsbury, Jr. Collections 11 (2003): 1-27.